* ❤ Khaori Sato オフィシャルブログ ❤ *: Mhaiko's birthday party @ Enchanted Kingdom!! 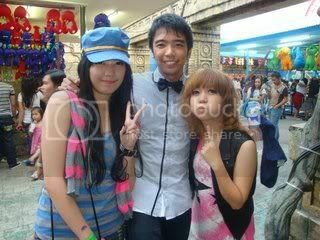 Mhaiko's birthday party @ Enchanted Kingdom!! 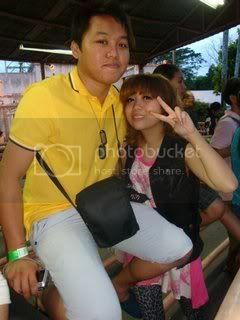 Last January 16, We went to Enchanted Kingdom at Sta. rosa laguna to celebrate Mhaiko's Birthday ( my sister )!! We had soo much fun that day even we really don't have enough time to sleep before we went to EK. Haha!! We dont have our own car so we decided to take a bus. ( Poor us! LOL ) However, that doesn't matter at all because we enjoyed the whole trip to laguna..
Its almost 2hrs bus ride to EK and we're lucky because there is no traffic that time.. yaay!! We arrived at EK around 10am but its not yet open so we waited there untill 11am! Here are some of our pictures inside EK. After a few hours of riding different rides, we went to where the space shuttle is and meet this pretty gal name Yapo & her BF Bryan. After we ride it, we decidet to take a rest @ lounge and luckily we met the band called BLOOMFIELDS!! Then my Bf told me that they are popular in playing vintage songs like beetles etc. I really had fun at mhaiko's birthday!! I last visit EK a couple of years back. and still EK was the best!! Thanks to Mhaiko's friend Jemz, Yapo and Bryan for the happy time we spend at EK..
and for my sister Mhaiko, Happy birthday and God bless more birthdays to come for you! !